In February of 2011, a friend of mine introduced me to Pinterest. I was looking for a new home and she said “I’ll send you an invite to Pinterest. It’s a great way to find decorating ideas and organize them.” I decided to give it a try and a year later I’m using this “virtual bulletin board” every day and not just to decorate our new home. Before Pinterest, if I found something on the web I wanted to remember or come back to, I had to either bookmark it, email it to myself or print it out. Well, I wasn’t very good at doing any of these things or remembering the addresses of any blogs I visited, which is why I fell in love with Pinterest. Hopefully after this post, I can at least spark your interest in Pinterest. 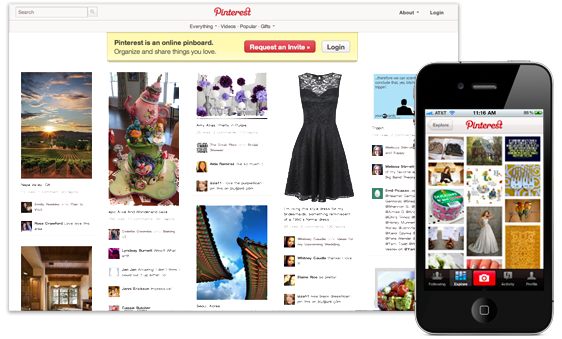 How is Pinterest used? What is being pinned and shared on Pinterest? I’ve seen people use Pinterest to plan their weddings, vacations, birthdays, baby showers and holiday parties. Members are discovering art, furniture, fitness routines, music, gifts, books, and recipes. People are being inspired whether it be photography, interior design or DIY projects. People are even nostalgic on Pinterest – pinning vintage fashion, childhood toys and photos of celebrities from long ago. You can pin things you find online or upload pictures to the Pinterest app from your camera phone. You can also “repin” things that anyone else is pinning. I love seeing what projects my friends are working on and sharing ideas. The pinning possibilities are endless. You can login with either your Facebook or Twitter account and it shows you which friends from those networks are also on Pinterest. You can also follow strangers on Pinterest that share the same tastes and interests. I like that I am able to follow my real life friends but that I can also follow people I’ve never met without having to “become friends with them” and it doesn’t make them follow me just because I’m following them. This week Mashable posted a January 2012 study titled “Pinterest Drives More Traffic Than Google+, YouTube and LinkedIn Combined” Wow! I was floored when I saw this. I knew Pinterest was gaining a reputation just by seeing the number of my Facebook friends joining daily, but I didn’t realize just how popular it had become. Just imagine the value of this free exposure for companies whose products are being pinned and repinned hundreds of times! The study Mashable posted said “Pinterest accounted for 3.6% of referral traffic, while Twitter just barely edged ahead of the newcomer, accounting for 3.61% of referral traffic.” A website coming just under Twitter for referral traffic last month should make any marketer or business owner want to know more. One of the reasons I believe Pinterest is so popular is because it’s a simple and visual site. When you pin a blog or website, it grabs an image from the website and automatically creates a link back to that website. So when you are browsing your pin boards or your Pinterest feed, it’s all pictures with small captions that link back to the original source. There are two things you can easily add to your website to connect your brand with Pinterest and directions for adding these buttons to your site can be found here on Pinterest’s website. 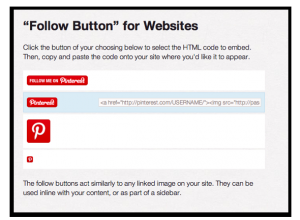 You can add a “Follow Me on Pinterest” button to your website and create a Pinterest account in the name of your business or have it link to a personal account. You can also add ‘Pin It’ buttons to your website to encourage your visitors to share your products, videos, blog posts and articles on their pin boards. We have already integrated the ‘Pin It’ button on a couple of our clients sites and the results have been great. Entice your customers to pin pictures of your products – offer something in return for them spreading your brand on Pinterest. Remember that images of good quality on your website are key because Pinterest is all about the visual. As with any social networking site, it’s important to behave on Pinterest as you would in the offline world. Don’t just shout your brand. Follow other users and boards related to your areas of interest and like other Pinterest users pins by clicking on their Pinterest Like buttons. Remember to advertise your pins on other social networks such as Facebook and Twitter. You are now able to post what your are pinning to your Facebook Timeline. Do you see a way your brand could benefit from the rising power of Pinterest? I hope you found this blog post pinteresting! If you need an example of pin boards and what Pinterest is all about, please feel free to visit my personal Pinterest page. Also, if you need an invite to Pinterest, email me.